This World Cup has proved to be one of the most fascinating and intriguing in recent history. We've seen it all: upsets, comebacks, stoppage-time winners, own-goals, decisions overruled by VAR, shocking theatrics and simulation, legends in the stands and the stars on the fields. The games have been played at a good pace and teams have contested for every inch of the pitch. In a team sport, everyone needs to be working in unison and doing their part to ensure that their side has the best possible chance of succeeding. However, every now and then, a moment of true inspiration or an act of sheer brilliance can make the difference. One man, seemingly possessed, can go on to do something that not only affects the game but also history. The finish was stunning but what preceded it was sheer brilliance. Russia have been a revelation in the 2018 World Cup. Whether it had anything to do with them hosting the competition itself is a matter of speculation, but the performance of the players is not. At the heart of their miraculous quest for glory was a man who has failed to reach his true potential until now - Denis Cheryshev. 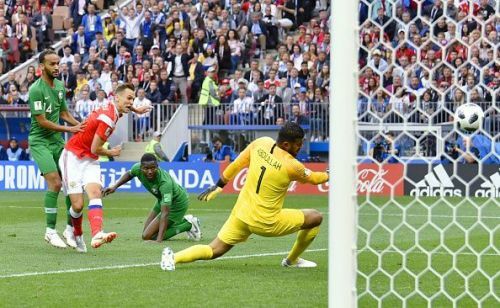 After a professional career that failed to materialize with bleak spells at Real Madrid and a couple of other Spanish sides, Cheryshev has truly attained cult status with the Russian National team. He embarked upon an incredible goal-scoring journey in Russia 2018, as he leathered the ball into the back of the net, in at the near post, but it was the touch to dink the ball over two sliding defenders to create the space that we couldn't get past. A second touch to get away from the third defender and a third to finish. An absolute stunner from the Russian to get, what has turned into, the most fascinating World Cup in recent history up and running! Messi & Ronaldo: The end of an era at the biggest sporting spectacle in the world?